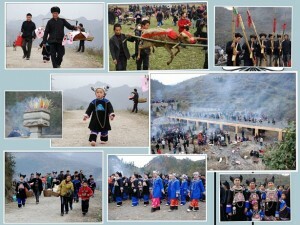 An annual rites of offering sacrifices to bridges is held on ‘E Yue E’ (the 2nd day of the 2nd month according to the Lunar calendar) in many minority villages in Southeast Guizhou Province. At Sansui’s Zhaitou village, which is a Miao village with over 1000 households and a population of more than 4000, the people take on it as one of the most important festivals. On the daybreak of that day, people all making up beautifully and wearing new clothes and jewelry start to carry sacrifices to the bridge about 3 kilometers away in the valley of the mountain behind the village. A water buffalo or an ox and a big pig are often killed by the bridge as the public sacrifice, while every family bring their chickens, ducks, fish, pork, rice, cakes, sugar and so on as their private sacrifices. When the right moment comes, all the animals are killed with their blood pouring on the bridge, after being cleaned, the animals begin to be cooked in groups of different families, now smog winds around the bridge and the fragrance from the pots is overflowing. Children running here and there and many others, especially the young people are dancing with Lusheng played. It’s getting to the noon, people have gathered more and more and all the meets have been ready, people crowd on the narrow bridge floor offering sacrifices to the bridge in the family groups, it is the real dignified moment! Then after firecrackers sounding, lunch starts! Great eating and drinking rice wine and finally people must playing fingers guessing game with the words of ‘full of treasures’, wish treasures are full of their houses!! Lunch usually lasts till later afternoon before going home! It is said: The Miao people at Zhaitou village used to live in a place called ‘Yewushan’ long time ago. The original small village there was getting bigger and bigger, and the small piece land of the ‘Yewushan’ could no longer hold all the families. They decided to move out to find a new and bigger place. They found it later and moved to this place called ‘Zhaitou’. It was a nice comfortable place to live, but the people were still missing their old place and filling the dragon artery there was very good, which had protected them and brought them good luck for a long time. They really wanted to bring it to their new location. However the Shiping River divided the land into two parts. So a bridge had to be built to connect these two land plates and the dragon artery could come to them and continued to bless them and bring them prosperous life for ever! The whole village is made up of 12 families, and each family work for one arch to make this bridge rest on 12 arches. And also each family offer sacrifices to their own arch when the day comes. And the bridge was built on ‘E Yure E’, when people worship it.